If you’re like me, you’re pretty picky about your running apparel. You’ve seen it in my reviews, and you’ve probably seen my pictures…my running gear is pretty specific; if something doesn’t fit my routine, I’m pretty unlikely to try it out. This is problematic in winter and this unusually cool spring weather. Why? You might ask? Well…my preferred running gear is a tank top and running tights. It doesn’t vary a lot from that. I can’t stand short sleeve shirts that pull funny and feel uncomfortable and running in long sleeves is a huge adjustment to me. If I’m distracted by what I’m wearing, the rest of my run suffers. Comfort is key! However…I hate feeling cold. I’ve written about it before and anyone who has run with me outside can attest to it; I’m a huge cold weather wimp. Blame it on whatever you’d like, if I’m cold, you’ll hear about it (to further this point, my favorite piece of office equipment is my space heater…it sits next to my hands year round!). 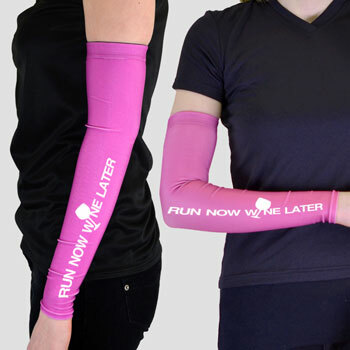 This causes an issue, so I was pretty excited when I had the opportunity to review Gone For A Run’s Gazelle Runner Arm Sleeves through their ambassador program. 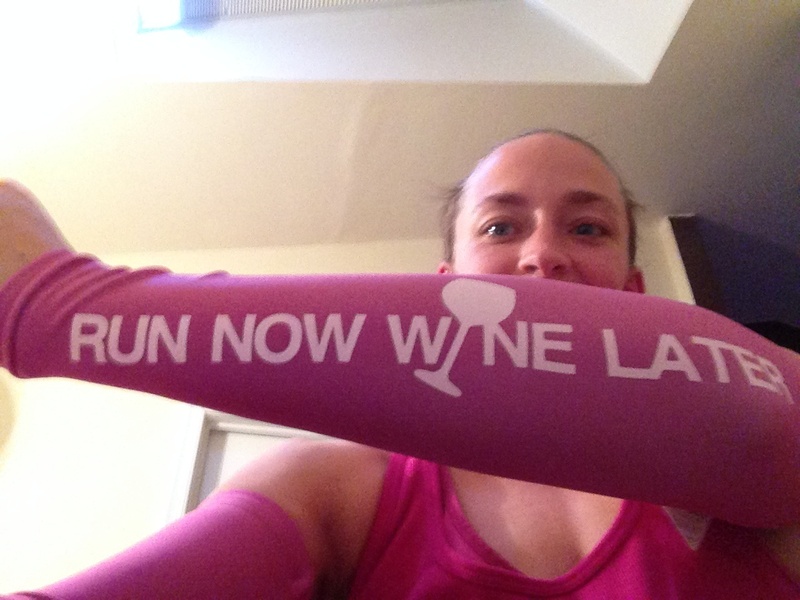 They’re fun…pink, and well, they promote one of my favorite things about finishing a run…the fact that a nice glass of wine can follow it! But, I was still a little apprehensive. I mean, Sure, they’re cute. They fit my attempt to look like a seasoned runner…but, they had to be functional. Any sliding or uncomfortable pinching and I was ready to be done with them. So, I decided to give them a go on a quick 3 miler. The verdict? To start, I kept them on the whole run…and have worn them multiple times since! Below, see me smiling after completing a 6 miler in them. At no point during any of my runs have they rolled, slid out of place or caused any discomfort. Available in multiple sizes (with arm widths listed on the site), these do exactly what they’re meant to – provide warmth with comfort. Also, easy to wash and available for just 25.99, I believe they’re worth the investment. Even if you’re not sure about it – I know I wasn’t – I’d encourage you to check them out, along with any other Gone for a Run products, today! Come race day – especially during a cool spring morning – I can pretty much guarantee you’ll thank me! As a note – I was given this product for free. However, I don’t advocate a product if I don’t believe in it…you know me better than that! These opinions are my own and were not purchased, or otherwise encouraged!